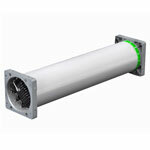 The Ionpure VNX-HH electrodeionization module from Siemens provides feed water hardness tolerance. The device features a hardness level of 2 ppm as CaCO3. The module has options for treating difficult feed water, and offers capital cost savings by eliminating the need for two-pass reverse osmosis.